Recolize is a Software-as-a-Service with monthly payment of your used clicks. You can find further information to PayPal here. Which data is used to generate personalized recommendations? If a shop visitor is anonymous and visits the page e.g. for the first time, then his clicks on products, add to carts etc. is tracked. Every time the visitor clicks or moves from page to page, his profile is updated and his recommendations get updated. What are the benefits of a Software-as-a-Service model? Recolize is provided as a Software-as-a-Service that means you do not have to take care of any infrastructure issues, hardware failures, software updates, etc. We do everything for you and you get in return the generated personalized product recommendations. Unlimited scalability: No matter if you have hundreds, thousands or millions of visitors on your website the Recolize recommendations will always be calculated extremely fast within around 100 milliseconds. Our German datacenters are highly secured to confirm with the German data privacy laws. So what are you waiting for? Register for free and check these points out. 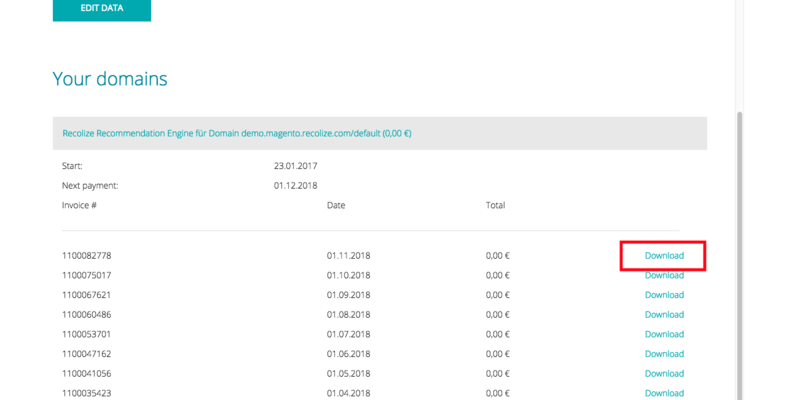 Where can I download my Recolize PDF invoices? How to integrate the Recolize Opt-out? Recolize Recommendations also work with active Opt-out without any issues. Then non-personalized products are delivered, that is only product-based cross sells and best sellers, which increase the conversion rate of your website. “Activate Opt-out”: this text will be displayed if the Recolize Opt-out is not active. With clicking on the link, the Recolize Opt-out will be activated and the link text will switch to “Deactivate Opt-out”. “Deactivate Opt-out”: this text will be displayed if the Recolize Opt-out is already active. With clicking on the link, the Recolize Opt-out will be deactivated and the link text will switch to “Activate Opt-out”. When do you count a sale as conversion? Recolize uses the so called conversion conversion tracking to determine, which articles were bought over the personalized recommendations by your customers. Therewith we have a powerful tool to optimize your recommendation configuration in the Recolize Tool and to generate more revenue with your product recommendations. A sale will only be counted as Recolize conversion when a user clicked exactly the bought product in a recommendation widget. The sale of an article will be tracked as Recolize conversion when it is in a close temporal connection to an interaction with a recommendation. Recolize only tracks the information for bought articles and of course no personal data of your customer like addresses, email address etc. How Does Recolize Determine the Top 10 URLs in the Dashboard? In the Recolize Tool you can find 2 widgets in the dashboard displaying the top and flop 10 URLs. Here URLs are displayed where the personalized recommendations perform best respectively worst. If and which URLs are listed here Recolize automatically defines by intelligent logics. Therefore conversions, revenue, click count and views etc. are combined with complex algorithms and rated. Especially you should monitor the flop 10 URLs. With one click on the URL you get further information in the tool and recommended actions by our smart Customer Intelligence logic. For instance it can make sense to adapt the recommendation configuration and only display low-priced products or only articles from a specific category.